In this sequel to To All the Boys I Loved Before, Lara Jean finds herself in a real relationship with Peter, but despite their promises to tell each other the truth and not hurt each other, the relationship is rocky. He can't seem to keep his ex-girlfriend away and Lara Jean herself is tempted by a reunion with her old heartthrob John. Both of them suspect the other of infidelity. Lara's getting plenty of advice from the ladies at the nursing home and her younger sister, but she misses her Mom. After having spent so much time thinking about love, she is surprised to find that the real thing is so impossibly complex. 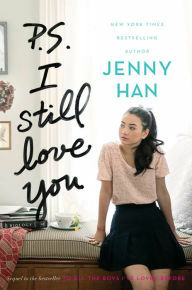 A cluttered, less focused, and weaker follow-up to one of my favorite Jenny Han books. In general, Han does a wonderful job exploring not only themes of romance but also of friendship and of familial ties. All that is present here, but it so much more awkwardly assembled. She's put in a whole bunch of subplots (cyberbullying, an elder sister's absence, a party for the nursing home residents, getting Dad to start dating again, etc.) and little of it fits together. The writing, usually so brilliant, is sloppy (and sloppily edited) (howlers include a metal box which "has eroded from the rain and snow and dirt" that the protagonist "wash[es] in the sink so it gleams again"). The ending is even more annoying, doing a last minute flip that contradicts much of the rest of the story -- the worst sort of surprise ending. All of this is shocking given Han's excellent prior track record and even the strong start of this novel.